Throw in a heap of Little Man Tate, a pinch of Simon Birch, mix it all up with elements of a revenge thriller and you'll just about be able to imagine the twee tone of this deranged tearjerker from Jurassic World director Colin Trevorrow, with a screenplay by novelist Gregg Hurwitz. A tragic and manipulative mid-point twist dials the schmaltz up to 11 in a film that manages to be both unbearable and strangely fascinating. Naomi Watts stars as Susan, an 'unconventional' mother who acts like a child and enjoys playing computer games much to the chagrin of her genius son Henry (an excellent Jaeden Lieberher). She works at a diner with her best friend Sheila (Sarah Silverman as an alcoholic waitress), while Henry oversees the family's finances and keeps a watchful eye on his younger brother Peter (an adorable Jacob Tremblay). When Henry comes up with a plan to save his school friend and neighbour Christina (Maddie Ziegler) from her abusive stepfather Glenn (Breaking Bad's Dean Norris) Susan steps up to the plate without hesitation. All the young actors hit their marks, with the interactions between the two brothers providing sweet relief. Watts and Silverman turn in decent performances despite their contrived characters but Norris is nothing but a one-note evil force who mostly sits silently in a chair swigging whisky. Ziegler gets one dance to show off her skills but even that is hampered by a ridiculous cross-cutting sequence. The film channels the spirit of 80s kids adventures and the influence of Steven Spielberg on Trevorrow (who's also set to direct Star Wars: Episode IX) is once again huge, with characters riding around on bikes, communicating via walkie talkies and taking Polaroids. 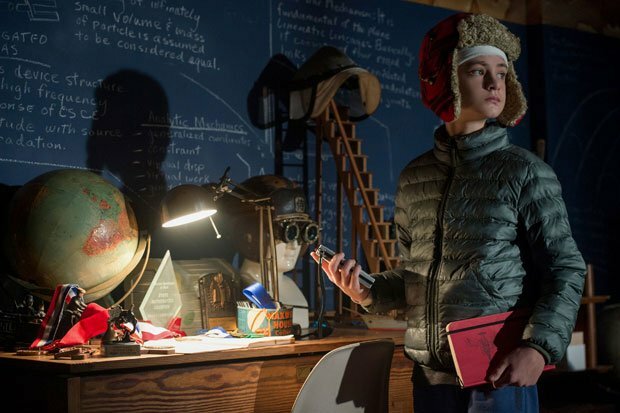 However, unlike recent Netflix hit Stranger Things which also worshipped the era, The Book of Henry fails to summon up any magic or tension. Despite good intentions, the misjudged screenplay juggles too many issues, while the longer the film wears on the more hilariously absurd it gets. Susan (Watts) is an unconventional mother whose genius son Henry (Lieberher) comes up with a plan to save his schoolfriend Christina (Ziegler) from her abusive father (Norris). A manipulative mid-point twist turns the schmaltz up to eleven in a deranged tearjerker which is both unbearably twee and strangely fascinating.